WHEN THEY pulled her out, she was not crying at all. Her tiny brow was wrinkled, and then her eyes grew wide. She looked at the bright lights, the white- and green-clad figures, the woman lying on the table below her. Somehow familiar sounds washed over her. On her face was an odd expression for a newborn—puzzlement perhaps. Leaving the monkeys, they turned a corner and came upon a great spindly-legged, long-necked dappled beast with tiny horns on its head. It towered over them. “Their necks are so long, the talk can’t get out,” her father said. She felt sorry for the poor creature, condemned to silence. But she also felt a joy in its existence, a delight that such wonders might be. After a few moments, tubes began to glow warmly, but no sound came. The radio was “broken,” and had been retired some years before in favor of a more modern variety. One tube was not glowing. She unplugged the set and pried the uncooperative tube out of its receptacle. There was a metallic square inside, attached to tiny wires. The electricity runs along the wires, she thought vaguely. But first it has to get into the tube. One of the prongs seemed bent, and she was able after a little work to straighten it. Reinserting the tube and plugging the set in again, she was delighted to see it begin to glow, and an ocean of static arose around her. Glancing toward the closed door with a start, she lowered the volume. She turned the dial marked “frequency,” and came upon a voice talking excitedly—as far as she could understand, about a Russian machine that was in the sky, endlessly circling the Earth. Endlessly, she thought. She turned the dial again, seeking other stations. After a while, fearful of being discovered, she unplugged the set, screwed the back on loosely, and with still more difficulty lifted the radio and placed it back on the shelf. As she left the spare room, a little out of breath, her mother came upon her and she started once more. She affected a casual air, but her heart was beating, her palms were sweating. She settled down in a favorite spot in the small backyard and, her knees drawn up to her chin, thought about the inside of the radio. Are all those tubes really necessary? What would happen if you removed them one at a time? Her father had once called them vacuum tubes. What was happening inside a vacuum tube? Was there really no air in there? How did the music of the orchestras and the voices of the announcers get in the radio? They liked to say, “On the air.” Was radio carried by the air? What happens inside the radio set when you change stations? What was “frequency”? Why do you have to plug it in for it to work? Could you make a kind of map showing how the electricity runs through the radio? Could you take it apart without hurting yourself? Could you put it back together again? “Ellie, what have you been up to?” asked her mother, walking by with laundry for the clothesline. In her tenth summer, she was taken on vacation to visit two cousins she detested at a cluster of cabins along a lake in the Northern Peninsula of Michigan. Why people who lived on a lake in Wisconsin would spend five hours driving all the way to a lake in Michigan was beyond her. Especially to see two mean and babyish boys. Only ten and eleven. Real jerks. How could her father, so sensitive to her in other respects, want her to play day in and day out with twerps? She spent the summer avoiding them. One sultry moonless night after dinner she walked down alone to the wooden pier. A motorboat had just gone by, and her uncle’s rowboat tethered to the dock was softly bobbing in the starlit water. Apart from distant cicadas and an almost subliminal shout echoing across the lake, it was perfectly still. She looked up at the brilliant spangled sky and found her heart racing. Without looking down, with only her outstretched hand to guide her, she found a soft patch of grass and laid herself down. The sky was blazing with stars. There were thousands of them, most twinkling, a few bright and steady. If you looked carefully you could see faint differences in color. That bright one there, wasn’t it bluish? She felt again for the ground beneath her; it was solid, steady . . . reassuring. Cautiously she sat up and looked left and right, up and down the long reach of lakefront. She could see both sides of the water. The world only looks flat, she thought to herself. Really it’s round. This is all a big ball . . . turning in the middle of the sky . . . once a day. She tried to imagine it spinning, with millions of people glued to it, talking different languages, wearing funny clothes, all stuck to the same ball. She stretched out again and tried to sense the spin. Maybe she could feel it just a little. Across the lake, a bright star was twinkling between the topmost branches. If you squinted your eyes you could make rays of light dance out of it. Squint a little more, and the rays would obediently change their length and shape. Was she just imagining it, or . . . the star was now definitely above the trees. Just a few minutes ago it had been poking in and out of the branches. Now it was higher, no doubt about it. That’s what they meant when they said a star was rising, she told herself. The Earth was turning in the other direction. At one end of the sky the stars were rising. That way was called East. At the other end of the sky, behind her, beyond the cabins, the stars were setting. That way was called West. Once every day the Earth would spin completely around, and the same stars would rise again in the same place. But if something as big as the Earth turned once a day, it had to be moving ridiculously fast. Everyone she knew must be whirling at an unbelievable speed. She thought she could now actually feel the Earth turn—not just imagine it in her head, but really feel it in the pit of her stomach. It was like descending in a fast elevator. She craned her neck back further, so her field of view was uncontaminated by anything on Earth, until she could see nothing but black sky and bright stars. Gratifyingly, she was overtaken by the giddy sense that she had better clutch the clumps of grass on either side of her and hold on for dear life, or else fall up into the sky, her tiny tumbling body dwarfed by the huge darkened sphere below. She actually cried out before she managed to stifle the scream with her wrist. That was how her cousins were able to find her. Scrambling down the slope, they discovered on her face an uncommon mix of embarrassment and surprise, which they readily assimilated, eager to find some small indiscretion to carry back and offer to her parents. This seemed to Ellie extremely witty, and she delighted in recounting it to her friends. But each time she quoted it there was an unspoken question lingering at the edge of her consciousness: Could you teach the alphabet to the ants? And would you want to? Down there with hundreds of scurrying insects who might crawl all over your skin, or even sting you? What could ants know, anyway? Sometimes she would get up in the middle of the night to go to the bathroom and find her father there in his pajama bottoms, his neck craned up, a kind of patrician disdain accompanying the shaving cream on his upper lip. “Hi, Presh,” he would say. It was short for “precious,” and she loved him to call her that. Why was he shaving at night, when no one would know if he had a beard? “Because”—he smiled—“your mother will know.” Years later, she discovered that she had understood this cheerful remark only incompletely. Her parents had been in love. “ ‘Bridgeport?’ said I . . .
She stared out into the blue lake, trying to imagine a city which could pass as both nineteenth-century Bridgeport and sixth-century Camelot, when her mother rushed up to her. In the seventh grade they were studying “pi.” It was a Greek letter that looked like the architecture at Stonehenge, in England: two vertical pillars with a crossbar at top—π. If you measured the circumference of a circle and then divided it by the diameter of the circle, that was pi. At home, Ellie took the top of a mayonnaise jar, wrapped a string around it, straightened the string out, and with a ruler measured the circle’s circumference. She did the same with the diameter, and by long division divided the one number by the other. She got 3.21. That seemed simple enough. The next day the teacher, Mr. Weisbrod, said that π was about 22/7, about 3.1416. But actually, if you wanted to be exact, it was a decimal that went on and on forever without repeating the pattern of numbers. Forever, Ellie thought. She raised her hand. It was the beginning of the school year and she had not asked any questions in this class. No one had ever called Ellie stupid before, and she found herself bursting into tears. Billy Horstman, who sat next to her, gently reached out and placed his hand over hers. His father had recently been indicted for tampering with the odometers on the used cars he sold, so Billy was sensitive to public humiliation. Ellie ran out of the class sobbing. After school she bicycled to the library at the nearby college to look through books on mathematics. As nearly as she could figure out from what she read, her question wasn’t all that stupid. According to the Bible, the ancient Hebrews had apparently thought that π was exactly equal to three. The Greeks and Romans, who knew lots of things about mathematics, had no idea that the digits in π went on forever without repeating. It was a fact that had been discovered only about 250 years ago. How was she expected to know if she couldn’t ask questions? But Mr. Weisbrod had been right about the first few digits. Pi wasn’t 3.21. Maybe the mayonnaise lid had been a little squashed, not a perfect circle. Or maybe she’d been sloppy in measuring the string. Even if she’d been much more careful, though, they couldn’t expect her to measure an infinite number of decimals. There was another possibility, though. You could calculate pi as accurately as you wanted. If you knew something called calculus, you could prove formulas for π that would let you calculate it to as many decimals as you had time for. The book listed formulas for pi divided by four. Some of them she couldn’t understand at all. But there were some that dazzled her: π/4, the book said, was the same as 1 – 1/3 + 1/5 – 1/7 + . . ., with the fractions continuing on forever. Quickly she tried to work it out, adding and subtracting the fractions alternately. The sum would bounce from being bigger than π/4 to being smaller than π/4, but after a while you could see that this series of numbers was on a beeline for the right answer. You could never get there exactly, but you could get as close as you wanted if you were very patient. It seemed to her a miracle that the shape of every circle in the world was connected with this series of fractions. How could circles know about fractions? She was determined to learn calculus. The book said something else: π was called a “transcendental” number. There was no equation with ordinary numbers in it that could give you π unless it was infinitely long. She had already taught herself a little algebra and understood what this meant. And π wasn’t the only transcendental number. In fact there was an infinity of transcendental numbers. More than that, there were infinitely more transcendental numbers than ordinary numbers, even though π was the only one of them she had ever heard of. In more ways than one, π was tied to infinity. She had caught a glimpse of something majestic. Hiding between all the ordinary numbers was an infinity of transcendental numbers whose presence you would never have guessed unless you looked deeply into mathematics. Every now and then one of them, like π, would pop up unexpectedly in everyday life. But most of them—an infinite number of them, she reminded herself—were hiding, minding their own business, almost certainly unglimpsed by the irritable Mr. Weisbrod. She saw through John Staughton from the first. How her mother could even contemplate marrying him—never mind that it was only two years after her father’s death—was an impenetrable mystery. He was nice enough looking, and he could pretend, when he put his mind to it, that he really cared about you. But he was a martinet. He made his students come over weekends to weed and garden at the new house they had moved into, and then made fun of them after they left. He told Ellie that she was just beginning high school and was not to look twice at any of his bright young men. He was puffed up with imaginary self-importance. She was sure that as a professor he secretly despised her dead father, who had been only a shopkeeper. Staughton had made it clear that an interest in radio and electronics was unseemly for a girl, that it would not catch her a husband, that understanding physics was for her a foolish and aberrational notion. “Pretentious,” he called it. She just didn’t have the ability. This was an objective fact that she might as well get used to. He was telling her this for her own good. She’d thank him for it in later life. He was, after all, an associate professor of physics. He knew what it took. These homilies would always infuriate her, even though she had never before—despite Staughton’s refusal to believe it—considered a career in science. He was not a gentle man, as her father had been, and he had no idea what a sense of humor was. When anyone assumed that she was Staughton’s daughter, she would be outraged. Her mother and stepfather never suggested that she change her name to Staughton; they knew what her response would be. Occasionally there was a little warmth in the man, as when, in her hospital room just after her tonsillectomy, he had brought her a splendid kaleidoscope. “When are they going to do the operation,” she had asked, a little sleepily. “They’ve already done it,” Staughton had answered. “You’re going to be fine.” She found it disquieting that whole blocks of time could be stolen without her knowledge, and blamed him. She knew at the time it was childish. That her mother could truly love him was inconceivable. She must have remarried out of loneliness, out of weakness. She needed someone to take care of her. Ellie vowed she would never accept a position of dependence. Ellie’s father had died, her mother had grown distant, and Ellie felt herself exiled to the house of a tyrant. There was no one to call her Presh anymore. Carl Sagan was Professor of Astronomy and Space Sciences and Director of the Laboratory for Planetary Studies at Cornell University. He played a leading role in the Mariner, Viking, and Voyager spacecraft expeditions, for which he received the NASA medals for Exceptional Scientific Achievement. Dr. Sagan received the Pulitzer Prize and the highest awards of both the National Academy of Sciences and the National Science Foundation for his contributions to science, literature, education, and the preservation of the environment. 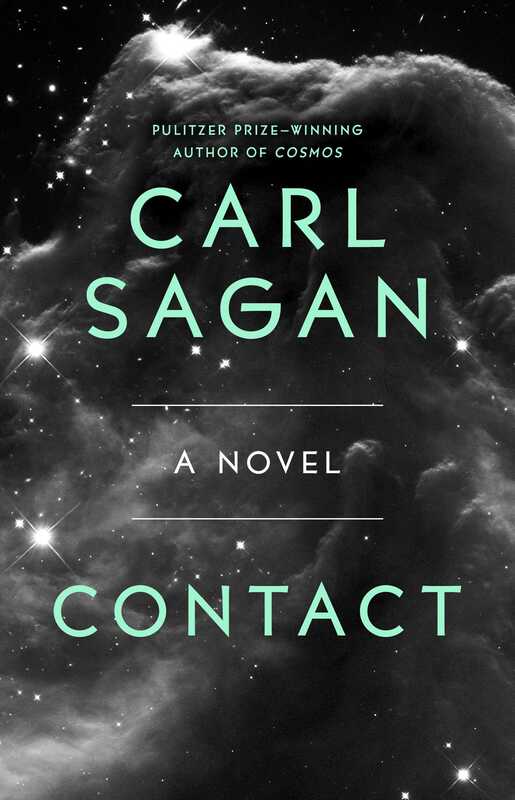 His book Cosmos was the bestselling science book ever published in the English language, and his bestselling novel, Contact, was turned into a major motion picture.